Konad Image Plate M57 Review,Swatches & NOTD - Glitter & Gorgeous!! 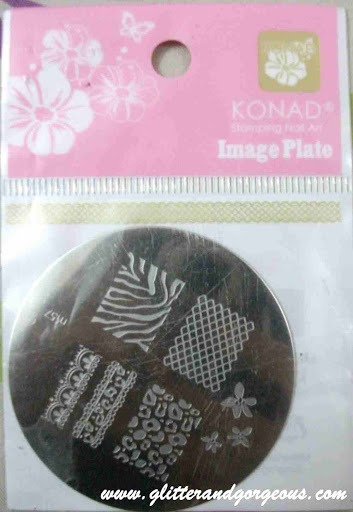 Today im going to review my favourite Konad image plate. Its M57 & comes with 6 designs. ‘Konadicure’ is a boon for girls who love nail art but don’t have a steady hand or the patience to paint all those intricate details perfectly. Konad Image Plate M57 has 3 full nail designs , 2 decorative designs that can used to decorate your tips & a flowerette design. 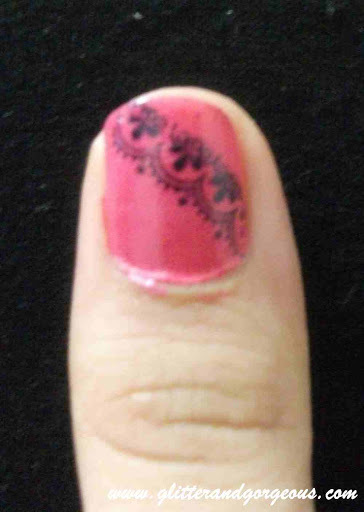 Im not too perfect with stamping yet so pls dont mind the ‘not so perfect’ nail art. 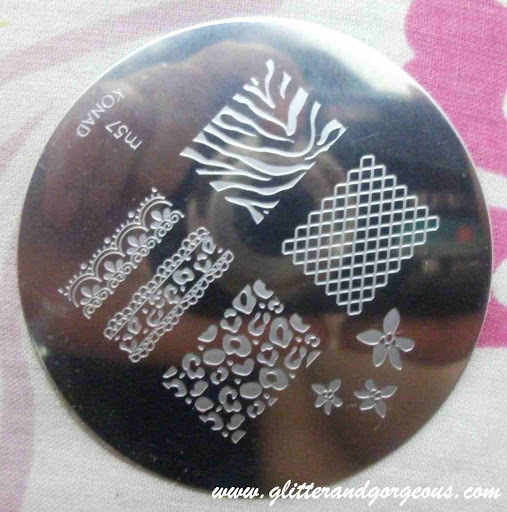 1) Zebra Print – I love this plate especially because of the animal print.The design adequately covers the whole nail. I like that the print isn’t delicate & has a well defined print so its quite noticeable unlike the smaller designs which as my mum says looks more like “ants on my nails” :P..Sorry I messed my zebra print a bit. 2) Net Design – Its a very pretty net design. I somehow always mess it up & never stamp it straight but thankfully I got it right this time!! 3) Leopard Print – OMG! MY absolute favorite design.I cant stop gushing about it.The design looks exactly like a leopard’s skin & stamps soooo well!!! Every time I wear ‘leopard nails’ I get loads of compliments for my nails. 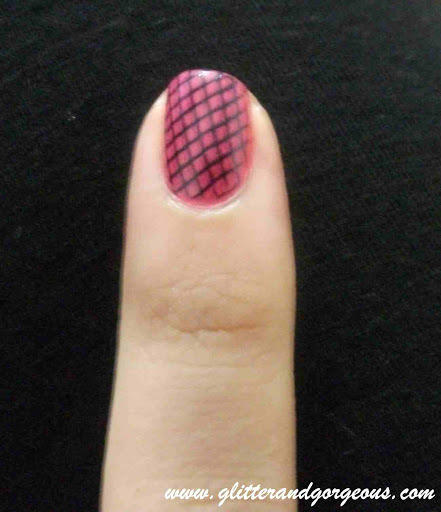 4-5) Decorative Designs – I usually use these tip designs diagonally on my nails. I’ve also used this between my nail and colored tips & it looks fabulous. 6) The flowerettes – I’m never able to fit all the 3 flowers together on my nail.I guess no one can so I only stamp two flowers on my nails.Its very prominent & stamps well. Overall I’m quite happy with this particular image & I especially love the full nail designs.The 3 full nail designs will adequately cover long nails but not REALLY long nails. At first I had gotten really dejected when I had bought the Konad T set as the image plate (M36) provided with it had really delicate designs & it was really hard for a beginner like me to get the placing of the designs just right! Also the designs weren’t as prominent as the designs in the M57 plate. So if you are just a beginner do buy the kit (as it’ll turn out cheaper) but do buy this image plate as well. My recommendation? Do I need to say it?! Its obvious how much I love it & if you’re a nail art lover then go grab it!! Very very pretty Rekha. I loved all the designs and your pink nail paint too 🙂 Will surely grab one.